“A Labour of Love” / The Tokyo Rail Network | IKIMASHO! I’m grateful to the people who take the time to write to me about Japan and Ikimasho! The majority of the stuff I get these days is from people wanting to know how to become a kindergarten teacher – actually this site ranks #1 if you Google the words Japan and kindergarten. Sometimes though, I get mails that are pretty left field and interesting. The other day I received a great mail from a guy called Bernie in Hong Kong that I just had to share. A lawyer by trade, Bernie has always been a cartographer and public transport enthusiast on the side. The map you see above is something he has created: a visual representation of the entire Tokyo railway network. If you are familiar with Tokyo, click on the map to enlarge it and have a look about. It’s pretty incredible – and from a pure design standpoint, I think its a beautiful piece of work. When I finally do decide to settle down I’m going to get one printed up and framed somehow. For a bit of context, I’ve included (with permission) Bernie`s email to me below. 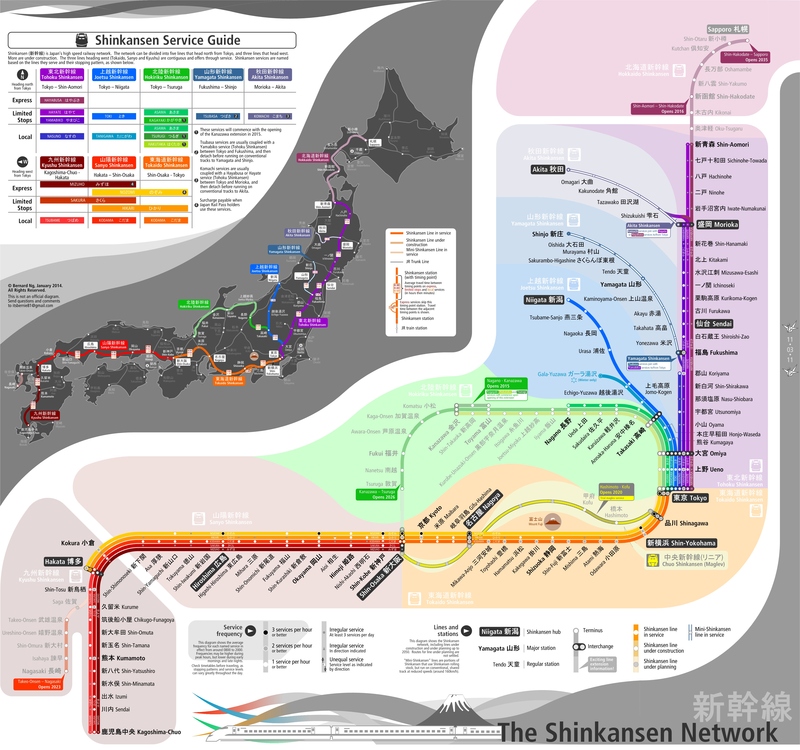 Have a read why he made the map – and check out another one he sent me of the Shinkansen network. My name is Bernie. I’ve been following your blog for quite some time now and it’s one of my favourites hands down. I’m a fellow fan of Japan, but never had the opportunity (yet) as you do to actually live there. I have tried to make up for it by frequent travel back and forth between Japan and Hong Kong (where I am based now, although I grew up in Australia). I really enjoy seeing glimpses of the more ordinary Japan through your blog. Anyway, I noticed a couple of your recent posts featured Tokyo’s railways – and your collaboration with Tokyo Metro was really cool! I happen to be a bit of a public transport enthusiast too, so you can see why going to Japan always gets me a bit excited from that angle. 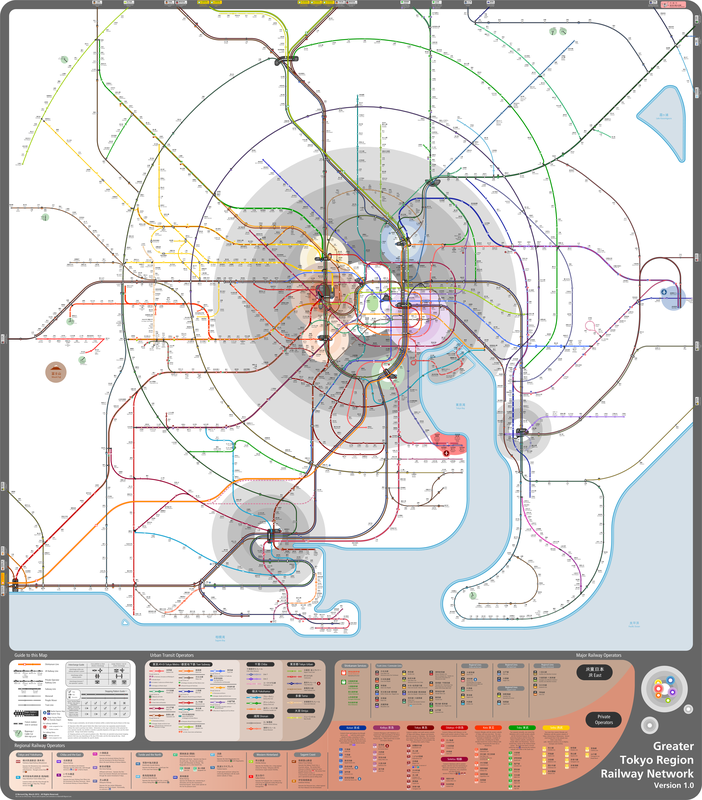 I also happen to love drawing maps of public transport systems. So I thought you’d get a kick out of seeing what I believe to be one of the few maps around that includes the entire Tokyo railway network – all subway lines, JR lines, the Shinkansen, private railway lines, the Toden line, various monorails and such. It’s a labour of love for me. I set out to draw this map because there are very few maps out there that show the entire railway network around Tokyo in one go. Each company publishes their own map, or makes a half-hearted attempt to show the connections (perhaps because they want you to stay on their own network!) As a tourist, I had real trouble navigating using the existing tools. Say I was staying in a hotel near Tsukiji, and after reading your blog entry on Takao-san, I wanted to take a daytrip there. No train map will explain the subway and rail connections needed in one go – the only thing I can rely on are the helpful staff at train stations, or mobile apps like Hyperdia. With a bit of persistence, my map should enable the tourist in me to figure out that I should catch the Oedo subway line to Shinjuku and change for a Keio train towards Takao-san. So, in short, I thought putting everything together shows just how incredibly large, complex and comprehensive the Tokyo railway network really is, and allows travellers to see the system as a unified whole, rather than a mish-mash of different networks that are not as disjointed as they may appear. Easily the biggest map I have drawn, and I don’t think I can top it for ages. I hope you enjoy. I look forward to keeping up with your adventures in Japan and beyond! Those maps are stunning! Someone needs to pay him for those and use them officially.